We begin the Advent season with sad news. One of KNOM’s founders, Thomas Busch, has died. Tom passed away peacefully, in his sleep, on November 1, 2010, All Saints’ Day. It was his 63rd birthday. Tom’s passing was completely unexpected; the shock and sadness we feel from the loss of our good friend is hard to quantify. Tom meant so much to so many. Without Tom, there would be no KNOM. In 1970, he was essential in helping to construct KNOM’s transmitter tower and its first broadcast studios. He served as the station’s general manager for decades and patiently mentored generations of KNOM’s full-time volunteers. There is no one involved with KNOM’s mission whose life was not touched by Tom’s enthusiasm and love; he leaves behind a legacy worthy of your pride. For almost 30 years, Tom was also the author of this publication, The Nome Static. Each and every month, Tom told the KNOM story. Through stories, inspirational spots, and pictures, he wrote – lovingly – of KNOM’s struggles and successes in broadcasting to the remote corners of Western Alaska. In each issue of the Static, he so enjoyed showing you the marvelous work of our great young volunteers and the KNOM staff. Amid our sorrow, that work continues. We are honored to be a part of the mission to which Tom devoted his life, and we are so grateful for your help: Tom always said that it was your prayers and support that kept KNOM alive. We invite you to join us in celebrating Tom’s life: you’ll find more about Tom at the end of this Static issue. We also invite you to pray for Tom and for his family. May God richly bless you in the days to come, and may we all find renewed joy and peace in this Christmas season. Called to Serve: As we go to press, we’ve just passed Veterans Day. This year, the holiday reminded us of a very unique way that Western Alaskans served their country during World War II: the Alaska Territorial Guard. The ATG was made up of thousands of Alaskans – sometimes, entire rural communities – who volunteered to defend the United States more than a decade before Alaskan statehood. Their ranks included young teenagers and senior citizens, and at any age, their expertise in surviving the harsh conditions of the Arctic was invaluable: both for themselves and for the soldiers and pilots they assisted. As KNOM’s Ben Matheson reports, a brand-new statue in Nome pays tribute to the extraordinary service of ATG women and men; one of the veterans on hand to see its unveiling was Franklin Okitkun (oh-KIT-kunn) of Solomon, Alaska – a settlement about an hour’s drive east of Nome. 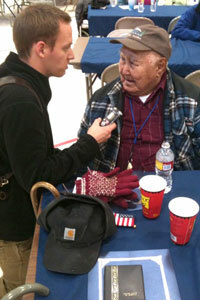 Okitkun (seen in the photo at left during his interview) joined the ATG at age 14 and says the volunteers had to make do with minimal provisions: just basic clothing and rifles manufactured in 1918, during World War I.
We’re able to bring stories like this to our airwaves every day: thanks to your support. At the heart of silence is prayer. At the heart of prayer is faith. At the heart of faith is life. At the heart of life is service. Remembering Tom: In mid-November, our Sounding Board call-in show addressed a special subject: the person who helped to create Sounding Board, and KNOM, in the first place. In the photo at left, news director Laureli Kinneen, general manager Ric Schmidt, and Nome parish priest Father Ross Tozzi lead a conversation about Tom Busch. Lord, as I put up my Christmas tree, help me to decorate my life, too. For every ornament I hang, let me bring a kindness to someone – and for each bright colored light, a smile and a laugh to another – so that my life, as much as my tree, will radiate Your joy. Despite a Blizzard, Community Ties – and Cottage Cheese: It’s one of the most common of Western Alaskan stories: someone gets stuck in a remote village, while traveling, because the weather conditions are too poor for air travel. 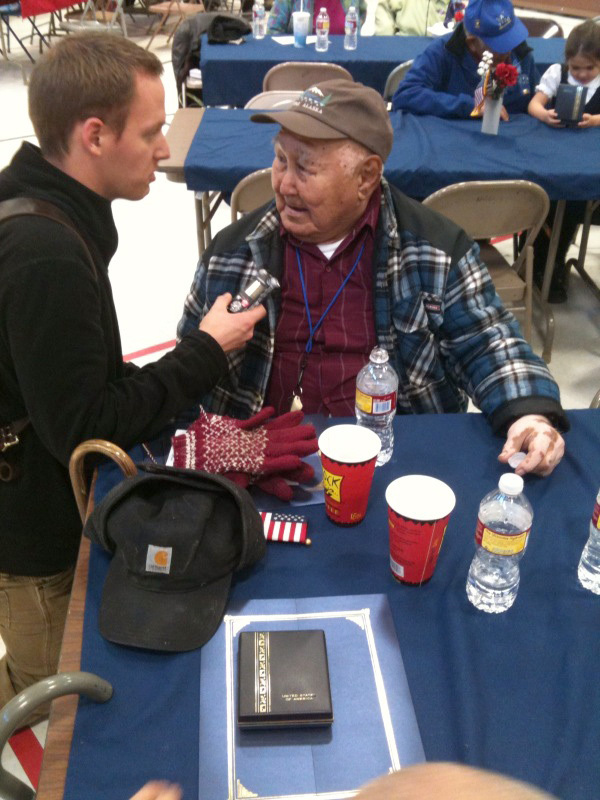 KNOM volunteer Matty Guiffré can now tell this story from first-hand experience. 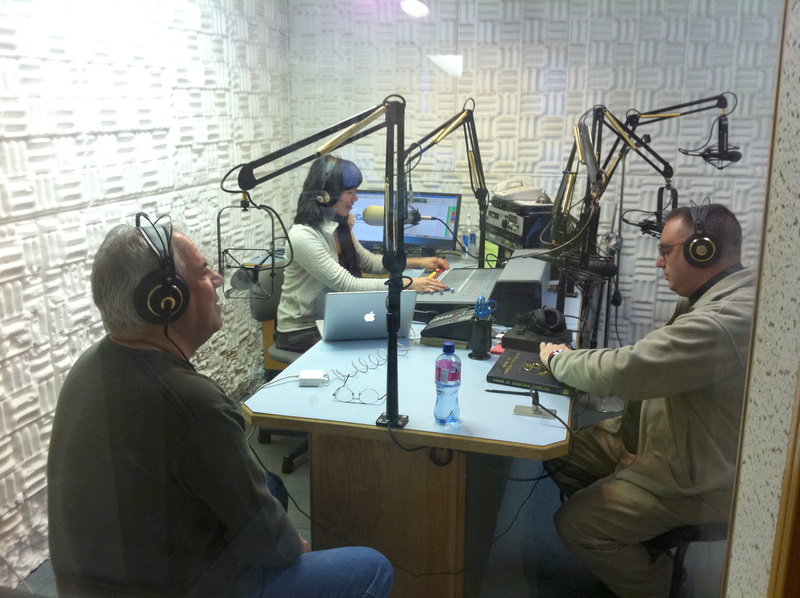 After a few days reporting on suicide prevention efforts in the village of Gambell – a village where KNOM listenership is exceptionally high – Matty was prevented from returning to Nome because of a late October blizzard. For Matty, however, it just meant one more night to enjoy the village’s exceptional hospitality. Rather than staying in the local school – often the default “lodgings” for our volunteers in a village – Matty was taken in by a friendly Gambell couple, Fran and Mike. Thankfully, Fen Kinneen, the husband of KNOM News Director Laureli Kinneen, is a pilot for one of the regional airlines in Western Alaska. In gratitude for his hosts, Matty arranged to put four large containers of cottage cheese on Fen’s next flight to Gambell. We’re told that Fran likes using it in her lasagna. At Christmas, the Prince of Peace came to dwell among men, hoping to bring peace to all nations, to all families, and, most of all, to each person’s life. It is still His wish today. May we each search for His peace this season. Serving Up Goodwill: KNOM morning show host Leah Radde recently teamed up with a few Nome grocery stores – and the KNOM listening audience – to donate to the Nome Food Bank. She gave our listeners in Western Alaska the chance to “win” food to be given, in their name, to the food bank. From both the grocery stores and our listeners, the response was fantastic. Hundreds of dollars’ worth of food was donated. 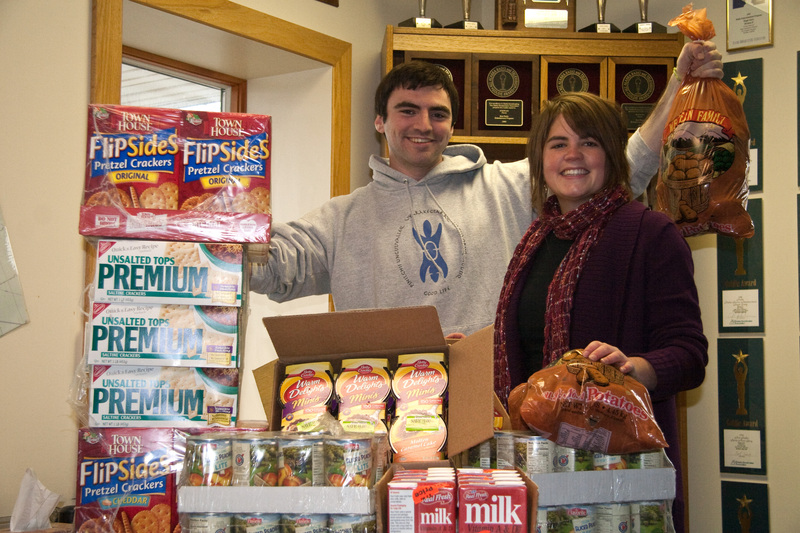 Here, Leah and fellow volunteer Matty Guiffré show off just some of the generous food contributions that have, already, surely made a difference in our region. Your support helped to make it happen! The Christmas manger scene is not just a pretty ornament. The stable in Bethlehem is trying to teach us many, many important lessons, if only we are willing to listen: lessons of humility, of simplicity, and, most of all, of love for God and for each other. Anchorage resident Thomas “Tom” Anthony Busch, 63, died unexpectedly November 1, 2010 at his home. Tom, an only child, was born November 1, 1947 in Philadelphia to Benjamin and Catherine Busch. He grew up in the Philadelphia area, where he graduated from high school. He went on to Boston College, where he received a bachelor’s degree in psychology with a minor in engineering and, later, an honorary Doctorate of Humane Letters. Tom married the love of his life, Florence Francis, on September 3, 1977. Together, they had 2 beautiful children: Stephen and Kathleen. Tom served on the Alaska Broadcasters Association Board of Directors for 18 years and twice served as its President. Having organized Alaska’s annual convention for many years, he was honored as their first “Broadcaster of the Year” in 1986 and was inducted into their Alaska Broadcasters Hall of Fame in 1997. That same year, Tom was presented with the Agnellus Andrew Award, becoming the only North American broadcaster ever to be so honored. 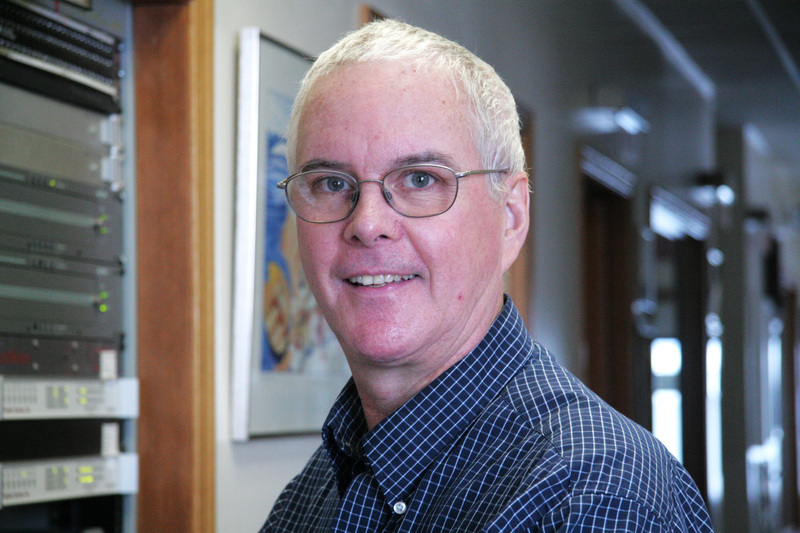 For eight years, Tom was Secretary for Nome’s Rotary Club, and he served as its president from 1992 to 1993. After moving to Anchorage, he continued his passionate involvement with the Anchorage International Rotary Club and was currently serving as its District Secretary. Tom also served as president for Kegoyah Kozga Library and for Nome Preschool, Inc., as well as other organizations in Nome. Since 1970, Tom had been an amateur radio operator: call sign NL7H. He held the highest class – Extra – and volunteered as a license examiner. Tom loved to talk, to tell stories, and to take pictures; he loved puns, researching information, and learning, and he was an inspiring author. He was patient, generous, and enriched all of our lives. Tom meant so much to so many, whether as a friendly voice on the radio, as a dedicated coworker and mentor, or as a devoted friend, uncle, father and husband. We will miss him greatly. Tom is survived by his wife of 33 years, Florence; son Stephen; daughter Kathleen and her husband Jonathan Dumais; cousin Mary Belz and her children Aaron and Kristen; cousin Ginny, her husband Al Rojas, and their children Allison and Chris; sister-in-law Elsie, her husband Tim Boudreau, and their children Mattheu, Jonathan, and Shanelle; sister-in-law Margo Francis; brother-in-law Rudy Francis; and nephew Benjamin Hunter Francis. Tom was preceded in death by his parents Benjamin and Catherine, by his mother- and father-in-law Theresa and Edgar Francis, and by his brothers-in-law George Francis and Benjamin Francis. In lieu of flowers, the Busch family has asked that donations be made to KNOM Radio at P.O. Box 988, Nome, Alaska, 99762. The photos at left are web extras (not seen in the print edition of the Christmas 2010 newsletter); they're taken from recent issues of The Nome Static. For more, visit our compilation of photos and memories of Tom, which includes stories and recollections shared by Tom's friends, loved ones, and colleagues. Copyright © 2010 KNOM Radio Mission, Inc. All rights reserved.